A little diamond off the south coast of England, the Isle of Wight is a bit of a gem when it comes to camping holidays. It might be small but there’s a wealth of things to see and do. Beaches, historic sites and beautiful countryside are part of what’s kept people holidaying here since Queen Victoria made the place fashionable. And with incredible coastal scenery and more hours of sunshine than most other parts of the UK, camping and glamping are great ways to stay. 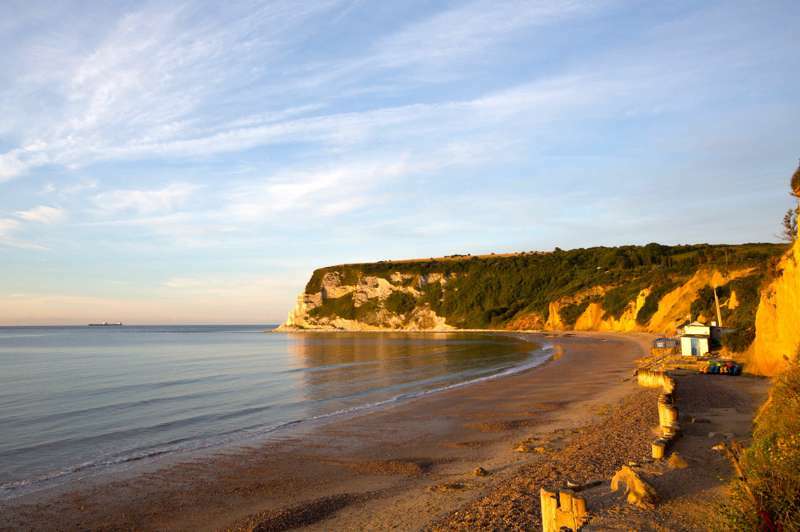 We’ve picked out the best Isle of Wight campsites for this collection. Choose yours, then pack up your camping kit, hop on the ferry and set sail for the Isle of Wight. The Isle of Wight looks like it’s broken free from England’s south coast and set sail. And while this chip off the old block shares much with the mainland, it also has a personality all of its own – and a microclimate to match. Sunny and sandy like much of the south, it’s got fossils like Dorset, downs like Hampshire, chines like Devon and the salty air and sailing of Southampton and Portsmouth. But it’s also got red squirrels, garlic farming, regattas and music festivals. Who wouldn’t want to holiday here? With so much rural and coastal beauty we reckon camping and glamping are the best ways to stay – and when you see the views that are available we’re pretty sure you’ll agree. The best campsites on the Isle of Wight are the ones that make the most of the scenery and yet don’t cause a blight on it. We like places that try to blend in with the surroundings of this holiday island and, though demand means many of the campsites are on the large side, we choose only those which we think have something special to appeal to our Cool Camping fans. With a reputation for good weather and great holidays, it’s no wonder that the Isle of Wight is a hotspot for tents, campervans and caravans alike. Whether it’s a grassy pitch with nothing more than a great view or a hard-standing spot for your motorhome, the wealth of campsites on this island will have what you’re looking for. The sites our travel experts pick out for the Cool Camping collection have been carefully chosen. We think there’s something special about camping with your own tent or campervan and have a soft spot for pitch-your-own sites where you can set up a home-from-home. 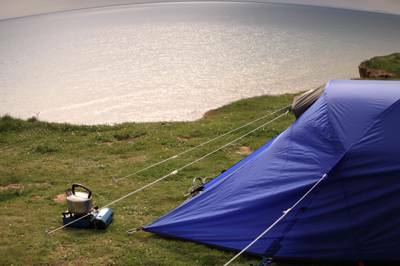 With a pitch on the Isle of Wight, it’s likely to be a spot to remember with plenty of campsites clustered on the downs in the the south west of the island – offering spectacular sea views. 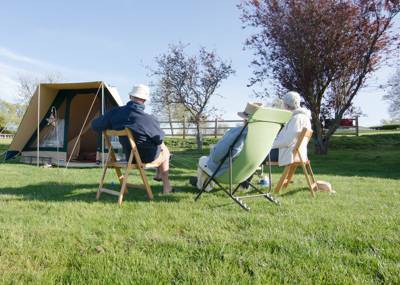 If you haven’t got your own tent or just don’t fancy pitching it – opt instead for glamping. We’re as picky with our glamping sites as we are with our traditional campsites and look for places with Cool Camping appeal. It might be a site with safari tents, yurts and bell tents, shepherds’ huts or glamping pods. There’s no one set type of accommodation that the Cool Camping clan prefer and it’s not always about the highest-end luxury – in fact sometimes the wackier the accommodation, the better. But, as with the more traditional camping sites we favour, we’re looking for something special that sets a place apart. It might be a beautiful view and a special location or it might be a hot tub on the veranda. Small but perfectly formed and full of fun – a description that’s fit for the Isle of Wight and, perhaps, your children too. No wonder, then, that the two make a great pairing. 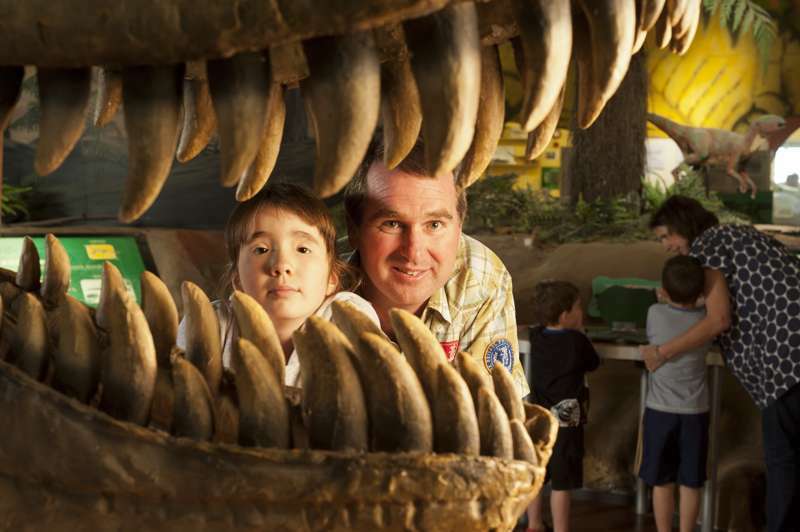 With beaches, trains, dinosaurs and great campsites all adding to the attraction of this island off the south coast, it could have been made for family holidays. It gets lots of sun so you can spend long days eating ice creams and playing on the golden sands of its east coast beaches but, if the weather fails to play ball, there are wet-weather attractions too. Hide out at Britain’s first purpose-built dinosaur museum or hop on a heritage railway (see below for more details). The island’s compact size means that getting from place to place never takes too long so the kids won’t get tired of the travel and you can squeeze lots in to your holiday. In addition to all that, there’s the joy of camping itself. Pretty much all kids love the adventure that comes with a camping trip and, with an Isle of Wight holiday, the adventure starts before you even arrive. The ferry trip to the island will heighten the anticipation and it should make that little are-we-nearly-there-yet, last part of the journey go faster (after they’ve had a run around on deck). Then you arrive at the campsite. It’s our experience that it will be a matter of minutes before your kids start making new best friends. The freedom and the joy of being outside all day are enough to keep kids smiling and come the end of the week, we predict, you’ll find it difficult to get them in the car to home again. A huge part of the fun of visiting the Isle of Wight is the fact that you have to cross the water to get there. A ferry crossing is just the thing to get you in the holiday mood: breaking up the journey before the last leg and giving you the feeling that you’re travelling to foreign lands. Okay so the The Solent, the stretch of water that separates the Isle of Wight from the south coast, is only four miles at its widest point but, nonetheless, it’s more of an adventure than another 20 minutes in the car. And we’re not the only ones to think so. The Frequently Asked Questions section of the official Isle of Wight tourist information site reveals that people often ask whether they need a passport and which currency to use on the island. There are several routes across the water taking between 10 and 45 minutes. Which you choose will depend on where you’re coming from, how you’re travelling and your thirst for adventure. Anyone with their own boat (or plane) could sail (or fly) across the water but, assuming that most of us campers will be taking the scheduled services, the next most exciting option is probably the Southsea (Portsmouth) to Ryde hovercraft. It’s Europe’s only remaining scheduled passenger service and a great way to travel to the island as it was on Wight that the first hovercraft was manufactured. It takes only 10 minutes and drops you at the resort of Ryde but it’s a passengers-only service – so you can’t take the car. 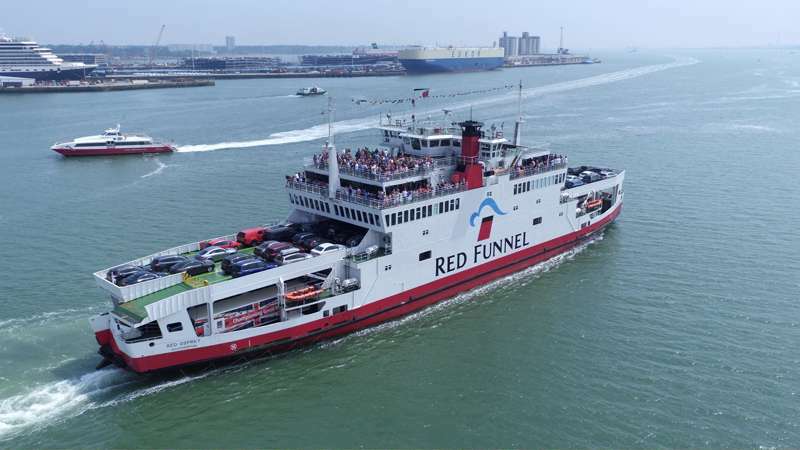 Other passenger-only services suitable for backpack campers and cyclists are Red Funnel’s Southampton to West Cowes ferry and Wightlink’s Portsmouth Harbour to Ryde catamaran service. Car and passenger services operate from Lymington, Southampton and Portsmouth too. More details can be found on our Isle of Wight Travel Information page. The beaches of the Isle of Wight have been attracting people on their holidays for as long as seaside holidays have been happening. 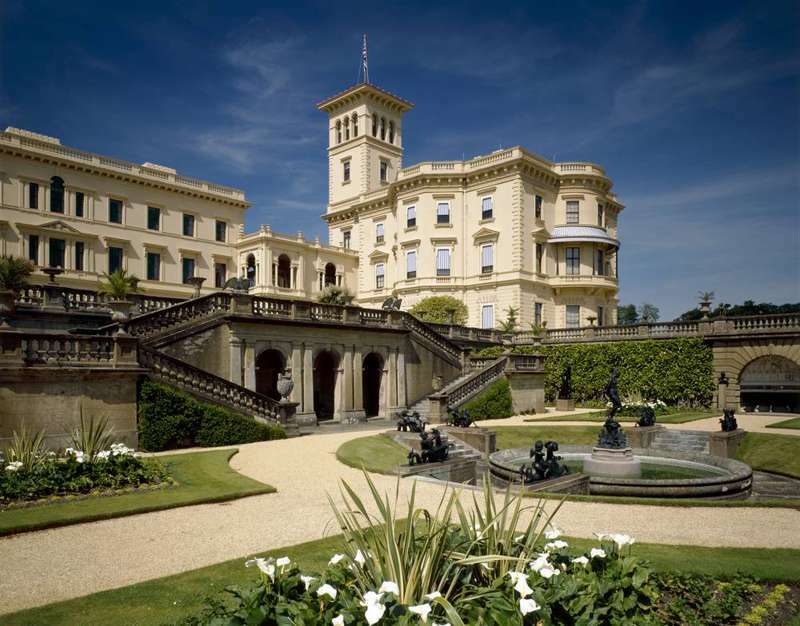 It was here, of course, that Queen Victoria had her holiday home – with her own private beach. With 57 miles of coastline there are plenty of beaches to choose from too and, as it’s such a small island, you’re never too far from one of them. There’s all the kiss-me-quick, crazy-golf, English-seaside fun you could hope for at Shanklin and Sandown. Both are on the south-east side of the island where the soft sands have been tempting people for about 200 years. Ventnor is further south still and offers more of the same with the added attraction of beach huts for hire and a 10-year-old paddling pool with a miniature model of the Ile of Wight in the middle. Meanwhile, Ryde on the north-east coast, looks towards Portsmouth. It’s the Isle of Wight’s biggest town and its vast, gently-sloping sands are great for beach games. The island is home to the biggest and most-famous regatta, not just in the UK, but in the world. Cowes Week take place at the beginning of August and brings with it a wealth of nautically-themed entertainment in and out of the water. Whenever you visit though there’s no getting away from the water and that’s what makes this a great place to try sailing or watersports. If you’re a seasoned pro, bring your gear and if you’re just starting out, you’ll find plenty of places to hire equipment or take lessons. 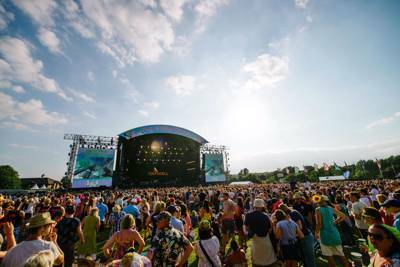 Take a look at the Visit Isle of Wight website for more information. If you want a quieter day at the beach during your camping or glamping holiday on the Isle of Wight, there are plenty of places to choose from too. On the busy south-east coast, a short distance north of Shanklin, are the quieter sands of Small Hope Beach. The beach is backed by cliffs and a row of beach huts with gently sloping sands that make it family friendly. The south-west coast is largely unspoilt and a designated area of outstanding natural beauty. Freshwater Bay and Alum Bay are popular beaches – both are close to The Needles, chalk stacks at the island’s westernmost point. 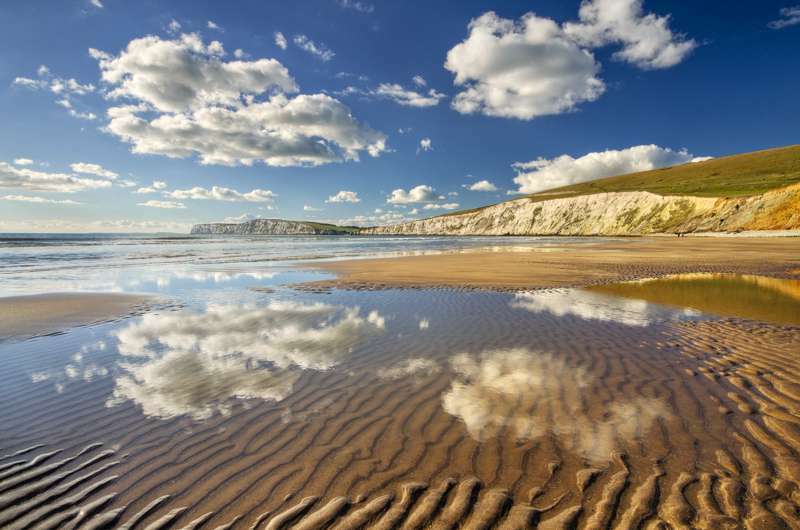 For more information check out our guide the best beaches on the Isle of Wight. Sailing and waterports, walking and cycling are all activities for which the Isle of Wight has a fantastic reputation and the island's history as a holiday destination means there are plenty of tourist attractions too. From natural highlights to purpose-built amusements and museums, you won’t run short of things to do when you’re camping on the Isle of Wight. After beaches, The Needles chalk stacks are probably the best-known natural attraction the island has. While they are a must-see for most people, the jury is out on whether commercialisation around the area has ruined the experience. On the walk from the National Trust car park to the cliffs you will encounter the Needles Landmark Attraction with fairground rides, eateries and more all designed to bring fun to the Isle of Wight’s westernmost spot. Families might appreciate the range of attractions and distractions but those more interested in geology and the environment may prefer to visit on a six-mile hike from Freshwater Bay instead. Shanklin is a big draw for tourists with its old village of thatched-roofed buildings and its sandy beach connected by the famous Shanklin Chine. This wooded gorge (which you must pay to walk through) has been a tourist attraction for more than 200 years and was admired by both Jane Austen and Keats. Of course, the island’s most-famous holidaymakers were Queen Victoria and Prince Albert. Their summer retreat Osbourne House is now one of the island’s most-famous places to visit and managed by English Heritage. Another English Heritage site on the island is Carisbrooke Castle and, for earlier history, there's Brading Roman Villa. All ages can get excited about the island’s dino credentials at Dinosaur Isle and pint-sized palaeontologists will probably also get excited about the life-sized dino dummies at Restricted Area 5 in the quirky and historic Blackgang Chine theme park. Other family-friendly attractions include Monkey Haven and The Isle of Wight Steam Railway. 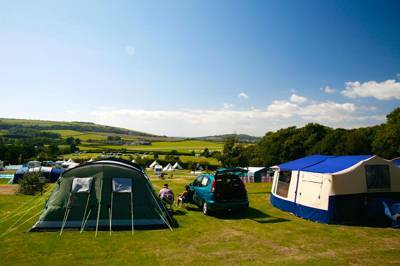 Isle Of Wight at Campsites on the Isle Of Wight, Browse the best campsites and glamping sites on the Isle Of Wight and book your camping or glamping holiday for the best price here. There’s lots to choose from, whether it be tent pitches, caravan-friendly campsites or waterside camps. Read on for a wealth of camping info.